Wikipedia - The Camargue horse is an ancient breed of horse indigenous to the Camargue area in southern France. Its origins remain relatively unknown, although it is generally considered one of the oldest breeds of horses in the world. 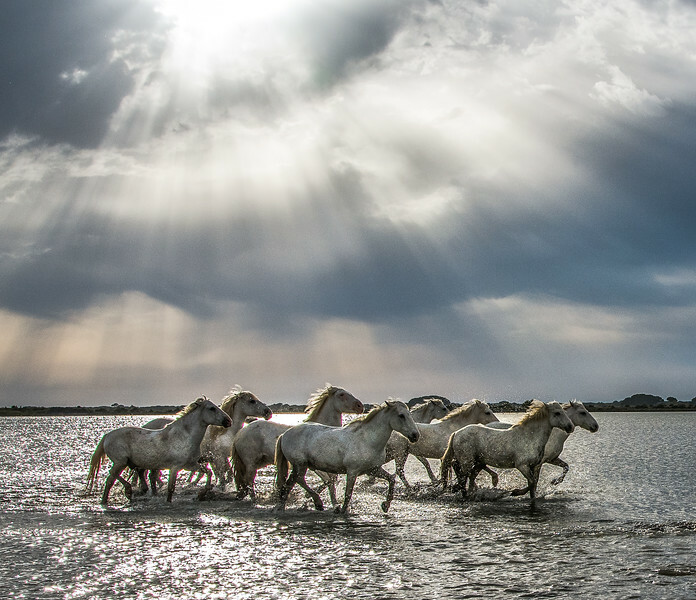 For centuries, possibly thousands of years, these small horses have lived wild in the harsh environment of the Camargue marshes and wetlands of the Rhône delta. There they developed the stamina, hardiness and agility for which they are known today. Traditionally, they live in semi-feral conditions in the marshy land of the region. The Camargue horse is the traditional mount of the Gardians (french spelling for Guardian or "keeper"). The Camargue Gardians are the "cowboys" who herd the black Camargue bulls used in bullfighting in southern France. Contact Tony Bonanno to learn about the 2019 & 2020 Camargue Photo Workshops.